Ooops: Nobody Eats the Bread! 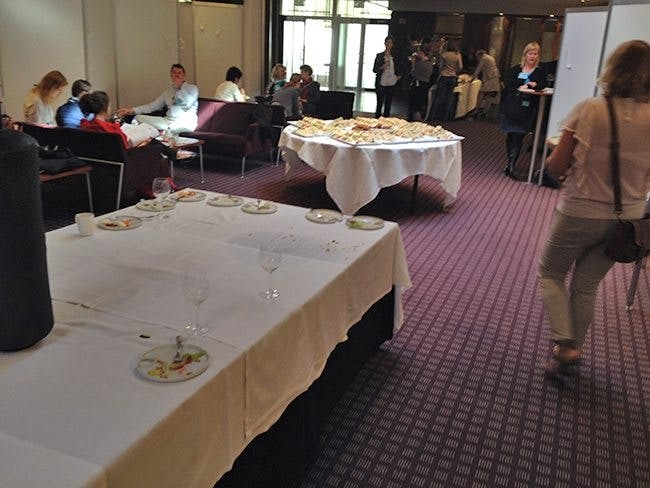 The nice buffet is removed at the nutrition conference. Lunch is almost over. But a smaller table of food is still barely touched. Guess what’s on it? I hardly saw a single nutritionist eating the bread. About 300 just had lunch and barely a sandwich is touched. Self-respecting nutritionists obviously don’t eat white bread anymore, at least not when their colleagues are watching. That’s good news. Of course things would have looked differently if this was dark whole-grain bread. But it’s a nice start! They even have to cut off the crust??? "Crusts are for peasants." ;-) A terribly out-of-date idea at a time when people are swooning over breads so artisanal that they have bits of the millstone in them. But isn't there an event planner for these things? 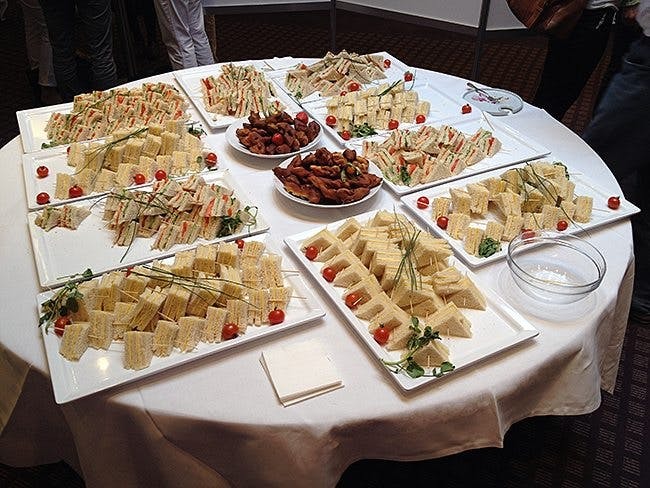 Somebody is making the decision to order platters of tea sandwiches, and I don't think it's the hotel. I hope you tried one kleina though (the ones in the middle)! Hmmm, that bread would pass for "whole grain" on this side of the Atlantic. But Doc, what's being said at that conference??? Earthquake! Nuclear meltdown! Scandinavian people not eating their sandwiches!!!??? Is it because they're not open-faced? Any sugary things served for dessert?